But even if one accepts that in those under 60 LDL cholesterol is a risk factor for the development of cardiovascular disease it’s risk has been not only been exaggerated but the drive to lower it by drug or diet as if this was the end in itself, as opposed to focussing on overall health has been entirely misplaced and potentially harmful. As Harvard’s Dr John Abramson points out cholesterol is one of the most vital moleclues “and to think you can radically pull this out of the body and not have consequences is ridiculous. It’s such bad science”. Other than statins no other cholesterol lowering food or drug that has come on the market has ever been proven to actually prevent heart attacks or death. And only a few months ago Cardiologists were stunned when a 12,000 participants randomised clinical trial of a new cholesterol drug that significantly reduced the bad LDL cholesterol and increased the good (HDL) cholesterol was stopped early when it did not prevent deaths from cardiovascular disease. In April recovery of incomplete data from a Minnesota heart study of 1957 revealed that replacing saturated fat with linoleic acid containing vegetable oils showed increased death rates despite significant reduction in cholesterol levels. In fact insulin resistance is the most important risk factor for heart attacks in young men. It’s implicated in the development of high blood pressure and is also a precursor to type 2 diabetes. Why do most people not know about this? Is it because there is no market to commodify this message? And the solution to dealing with it is relatively simple, cheap and dramatic. Only last week I saw a lady in her late 60’s who had been diagnosed with type 2 diabetes 25 years ago and had been on insulin injections for the past 17 years. Having read recent media reports that Type 2 diabetes is a condition of “carbohydrate intolerance” and ignoring what she’s been told for years she changed her diet and three months later no longer required the 80 units of insulin. What did you stop eating I asked her? “bread, rice, and sugar. But now I can enjoy eating cheese and butter again” she said with a beaming grin. The management of type 2 diabetes has been upside down for decades. The perception is a chronic irreversible condition; and it is treated with drugs that cost the UK and United States hundreds of millions of pounds and dollars respectively. Although these glucose lowering medications marginally reduce the complications of kidney problems, eye disease and nerve disease they don’t have any impact on heart attacks, stroke or death. Furthermore, side effects of these medications contribute to 100,000 emergency room visits a year in the United States. Yet this is another symptom of a wider system failure where commercial influences on key opinion leaders who have made their careers on the basis of a flawed hypothesis will not find it easy to admit they may have got it wrong or are presenting an incomplete picture to patients. When a lot of money is flowing to their department to support their research they’re certainly not going to bite the hand that feeds them. We should embrace the evolution of science but as I tell my medical students medicine is not an exact science but more a practice of the art of probability. But when doctors have to make clinical decisions based upon biased information corrupted by commercial influence, we cannot claim to practice ethical medicine. What’s worse it that even the medical information we have is not being given to patients in a transparent way to help them to make informed decisions on whether to take a medication or undergo an operation after weighing up the benefits and risks. It is estimated that just having this honest conversation with patients many of which would then make a choice to not undergo an operation that carries a 1% risk of causing a heart attack, stroke or death would save US health care $864 million a year. Money that could be better spent elsewhere. In a separate analysis of trials comparing exercise versus drug treatments Ioannidis found similar benefits on lifespan for the treatment of heart disease, rehabilitation after stroke, treatment of heart failure and prevention of type 2 diabetes. Two weeks ago a crowd funded documentary I’ve co-produced attempting to cut through the epidemic of misinformation on diet and health had a screening in New York having originally premiered in the British parliament. 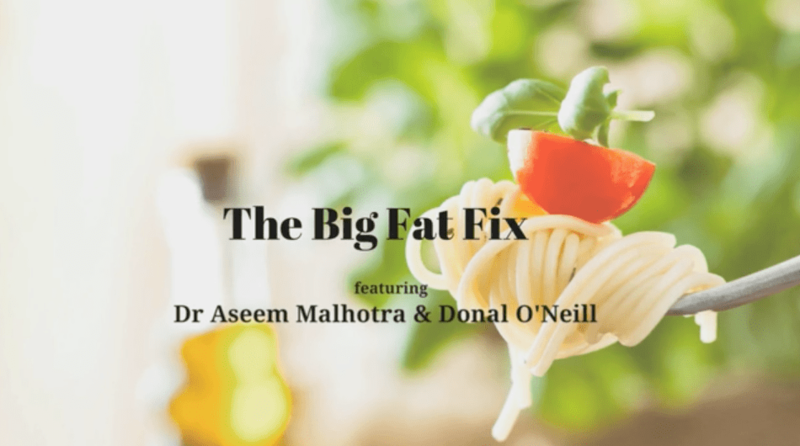 In it former international athlete, Donal O’Neill and I go back to the origin of the Mediterranean diet where Ancel Keys conducted most of his research aiming discover the true secrets of longevity. In the tiny Italian village of Pioppi we find out why the average life expectancy remains close to 90. Health rarely comes out of a medicine bottle but simple lifestyle changes can rapidly improve quality of life without side effects. As our film The Big Fat Fix demonstrates a combination of eating food that confers wellness with the right type of exercise and stress reduction is not only a powerful intervention in the prevention and treatment of chronic disease but may also slow down the ageing process. It’s time for health care to incorporate lifestyle medicine- it’s time for the “Big Fat Fix”. An edited version of this article was published in the Telegraph Newspaper on August 4th.